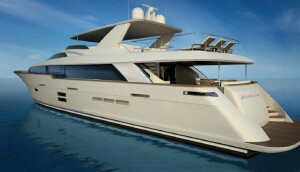 Hatteras Yachts is about to debut a new luxury yacht in the fall of 2013, the new 100 Raised Pilothouse! With Hatteras having some of the most luxurious yachts on the market, this is exciting news for yacht enthusiasts. This yacht is being envisioned as Hatters brand ambassador for the expansions being made to the yachting market. With four luxury staterooms and room for eight, this makes for a perfect vacation on the water. Each stateroom features its own premium A/V package that includes AM/FM radio with an iPod® dock, flat-screen LED TV, Bose® speakers, and a Blue-ray® disc player. Then you get to include a stocked wine cooler and the linens and bathrobes that come standard with the ship. With the anticipated LOA of 100 feet and a beam of 22.5 feet, the 100 Raised Pilothouse will not be lacking in volume. The enormous flying bridge comes equipped with a large wet bar, as well as specially designed modular furniture that is easily arrangeable to the owners needs. Besides the staterooms there is also a full-beam master suite, which is well appointed and truly opulent with its his-and-hers head and ample storage space. Then there’s the VIP suite, which offers a private bathroom, full-sized queen bed, and a large closet. Located above-deck you’ll see the pilothouse which includes a voluminous salon and a formal dining room. The salon has very large and open windows that give a sweeping view of both the port and starboard of this yacht, leaving you with a breathtaking view. Once leaving the salon you walk into a large galley with full-sized appliances to give an at home feel, and the large bar with ample seating. Looking up in the galley you notice a large integrated skylight, which is one of the most noticeable features in the 100 Raised Pilothouse. The pilothouse is also home to the luxury yachts helm, which is a series of computers and touch-screens that oversee all of the ship’s systems. From the helm chair the captain has full reign over the ship. Even the crew has nice accommodations on this luxury yacht. The captain gets his own stateroom, and the crew has a spacious bunkroom, with each room getting its own head. Attached to the crew areas is the crew galley that comes equipped with a sink, refrigerator, and microwave/convection oven. This makes a nice private area for the crew to kick back and relax away from the hustle and bustle above. As with all other Hatteras models, the 100 Raised Pilothouse is built on a solid fiberglass hull bottom that comes with a ten-year warranty. The high performance propellers, deep tunnel pockets, and efficient gear reductions all give the 100 Raised Pilothouse a competitive cruising performance.